Nairobi and Rio de Janeiro — Transforming wastewater from a major health and environmental hazard into a clean, safe and economically-attractive resource is emerging as a key challenge in the 21st century. Urban populations are projected to nearly double in 40 years, from current 3.4 billion to over six billion people — but already most cities lack adequate wastewater management due to aging, absent or inadequate sewage infrastructure. Yet many of the substances that make wastewater a pollutant — for example nitrogen and phosphorus — can also be useful as fertilizers for agriculture. Wastewater can also generate gases to fuel small power stations or be used for cooking. The report notes that already some 10 percent of the world's population is being supplied with food grown using wastewater for irrigation and fertilizer and with better management and training of farmers this could be increased substantially. The report, launched to coincide with World Water Day, goes so far as to say that the concentration of nutrients in wastewater "could supply much of the nitrogen and much of the phosphorous and potassium normally required for crop production. Other valuable micro-nutrients and organic matter contained in the effluent would also provide benefits". The report underlines that reducing the volume and concentrations of wastewater will require multiple actions ranging from reducing run-off from livestock and croplands to better treatment of human wastes. Some solutions may involve water recycling systems and multi-million or multi-billion dollar water sewage treatment works: the report cites the success of those installed in the Bali coastal resort of Nusa Dua in Indonesia. Others may involve investing and re-investing in nature's natural purification systems which include wetlands, mangroves and salt marshes. Studies in the Mississippi valley of the United States indicate that the value of a restored wetland may be as high as over $1,000 a hectare if its full range of services, from water filtration to recreational use, is factored in. Establishing markets and economic instruments for such services could offer the kind of financial incentives that favour conservation and restoration over draining wetlands for farmland. Other solutions can be small-scale: The report cites the coral coast of Fiji where it was estimated that up to 40 percent of harmful nutrients being discharged into the marine environment were from pigs, which produce three times more concentrated nitrogen waste than humans. Sawdust beds which soak up the liquid run-off from pig pens have now been introduced, and soiled sawdust is shipped to nearby farms as fertilizer. Emissions to coastal waters have been cut and the farmers are pleased too. This is because the more comfortable sawdust beds seem to make the pigs happier and thus bigger, so farmers have more meat to sell. Achim Steiner, UN Under-Secretary General and Executive Director of the UN Environment Programme (UNEP), said: "If the world is to thrive, let alone to survive on a planet of six billion people heading to over nine billion by 2050, we need to get collectively smarter and more intelligent about how we manage waste including wastewaters". "The facts and figures are stark — pollution from wastewater is quite literally killing people, indeed two million children die annually as a result of contaminated water. The impacts on the wider environment and in particular the marine environment are also sobering," he added. "But the report also points to the abundant Green Economy opportunities for turning a mounting challenge into an opportunity with multiple benefits. These include the savings from reduced fertilizer costs for farmers and, incentives for conserving ecological infrastructure such as wetlands alongside new business and employment opportunities in engineering and natural resource management," Mr Steiner said. Mrs Anna Tibajuka, Executive Director of UN-Habitat, said: "Urban and industrial wastewater composed of sediment, nutrients, organic matter, trace metals and pesticides, among others, adversely affects the entire food chain and thus human health". "Many water and sanitation utilities, especially in developing countries, are forced to spend more financial resources in water treatment due to increased pollution. Excess nutrients and wastewater can also lead to uncontrolled growth of algae and aquatic plants such as water hyacinth which cause practical problems for marine transportation, fishing and at intakes for water, hydro power and irrigation schemes," she added. "It is my hope that activities taking place globally today will raise public awareness of the water quality challenges facing humanity, and the need to commit to concrete remedial actions at all levels," said Mrs Tibajuka. Christian Nellemann, a lead author on the report, added: "Some estimates suggest that around 2 million tons of waste are spilled into sewage systems every day: this may be producing well over two billion tons of polluted water every single day, 365 days a year, right into our freshwaters and oceans". The Rapid Response Assessment, entitled "Sick water? The central role of wastewater management in sustainable development", has been compiled by a special taskforce consisting of the United Nations Environment Programme (UNEP), the UN Human Settlements Programme (UN-HABITAT), and the UN Secretary General's Advisory Board on Water and Sanitation (UNSGAB). It has also involved experts from UN Water and UNEP's GRID Arendal in Norway and was launched today at UNEP headquarters and at the World Urban Forum in Rio de Janeiro in support of this year's World Water Day with the theme Clean Water for a Healthy World. 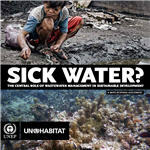 The report shows that the impact of poor wastewater management and degrading sewage systems is not only costing billions of dollars and degrading ecosystems, it is also challenging the achievement of the Millennium Development Goals, sustainable development, jobs, labour productivity and the health of hundreds of millions of people worldwide. Conversely, a recent report by the UNEP Green Economy Initiative underlined the economic benefits of investing in this resource. It argues that every dollar invested in safe water and sanitation has a pay back of $3 to $34 depending on the region and the technology deployed. At least 1.8 million children under five years-old die every year from water related disease, which is one child every 20 seconds. It is estimated that close to 90 percent of diarrhoea cases, killing some 2.2 million people every year, is caused by unsafe drinking water and poor hygiene. Over 50 percent of malnutrition cases globally are associated with diarrhoea or intestinal worm infections. Diarrhoeal diseases come second after respiratory infections in terms of labour productivity lost due to illness. Over half the world's hospitals beds are occupied with people suffering from illnesses linked with contaminated water. Almost 900 million people currently lack access to safe drinking water, and an estimated 2.6 billion people lack access to basic sanitation. South Asia and sub-Saharan Africa have the highest proportion, with around 221 million and 330 million respectively living without basic sanitation. 90 percent of the wastewater in developing countries discharged daily is untreated. 80% of all marine pollution is land based — most of it wastewater, damaging coral reefs and fishing grounds. Each day each one of us uses — and discards — some 150-600 liters of water — 60-150 liters per person per day in developing countries to 500-800 liter per person per day in the industrialized world. People in the industrialized world generate 5 times more wastewater per person than in developing countries — but treat over 90% of the wastewater compared to only a few percent in developing countries. Improved wastewater management has resulted in significant environmental improvements in many European rivers, but dead zones in the oceans are still spreading worldwide. Agriculture accounts for some 70-90% of all water consumed, mainly for irrigation. But large amounts also return to rivers in terms of run-off — near half of all organic matter in wastewater comes from agriculture. Industrial wastes, pesticides from agriculture and tailings from mining also create serious health risks and threats to water resources, costing billions of dollars to monitor, much more to clean. Use of bottled water is increasing, but it takes 3 liters of water to produce one liter of bottled water — and in the USA alone an additional 17 million barrels of oil. Worldwide 200,000 million liters of water are produced every year, creating also an enormous waste problem from spent plastic bottles. 20 million tons of phosphate is mined to fertilize crops, and there are concerns that natural phosphate may become scarcer over the coming decades. Nearly half of the agricultural phosphate applied is washed away and ends up rivers and oceans where it plays a part in triggering algae blooms that in turn damage ecosystems and fish stocks. The area of dead zones — locations of reduced or absent oxygen levels — has now grown to cover 245,000 km2 of the marine environment including in North America; the Caribbean, Europe and Asia. Wastewater also generates methane, a climate gas 21 times more powerful than CO2. It is also generating nitrous oxide which is 310 times more powerful than CO2. It is estimated that wastewater-linked emissions of methane and nitrous oxide will rise by 25 percent and 50 percent respectively in just a decade. Climate change may aggravate the problem with droughts concentrating wastewater pollution in rivers and lakes and increased flooding overwhelming ageing sewage infrastructure in cities and towns. Countries should adopt a multisectoral approach, including ecosystem management, to cope with rising wastewater production. Countries must establish national plans from water source to ocean and create national to local strategies. Over 70% of the water is consumed by agriculture for irrigation. Financing and investment are urgently needed and must address design, ecosystem restoration, construction, operation and maintenance of waste water infrastructure. Public management of the water supply and wastewater management have provided best results for broad public benefit, with private sector mainly beneficial in improving operation and maintenance. Communities and nations should plan for increasing incidents of extreme weather and rising urbanization in the future. For effective waste water management, social, cultural, environmental and economical aspects must be carefully considered. Education has a crucial role to play in water and wastewater management, helping to ensure water, nutrients and future opportunities for employment and development are not wasted.